It seems that Volkswagen (VW) engineers and designers have been very busy producing new and redesigned cars and trucks. In a market where SUV sales are at an all-time high and sedans are down, purchases of new Volkswagens are on the rise. Since April 2018, VW sales increased by 4.5 percent from 2017, driven primarily by its SUVs, the Compact Tiguan and the new 2018 family size Atlas. The German automaker quickly settled with the government on the diesel emissions scandal for a record $4.3 billion in 2017. Apparently, what could have turned into a PR nightmare, had little effect on its brand. All the while, it stayed busy planning a new lineup of vehicles for 2018. Soon after the settlement, VW began rolling out its new and redesigned SUVs and sedans. I got a chance to test drive the 2018 2.0T VW Passat R-Line, 2018 VW Golf SE, 2018 Atlas V6 SEL Premium, and the 2018 Tiguan SEL Premium 4Motion. After getting a taste of the latest VWs, I can?t wait to test the much anticipated 2019 VW Jetta, which recently went on sale and remains one of the World?s top-selling sedans. Facing stiff competition in the mid-size sedan segment, the Volkswagen Passat upped the ante in 2018. The 1.8-liter four-cylinder engine was upgraded to a smooth and quick turbocharged 2.0-liter that gets 174 horsepower, which is standard in the S, R-line, SE, and SEL Premium trim levels. Another engine that?s optional on the recently launched Passat GT includes a sporty 3.6 liter V-6 that generates 280 horsepower. The 2018 2.0T VW Passat R-Line that I tested was packed with convenient tech and safety features. It drove and felt like and a luxury want-a-be.? Exterior features included 19-inch alloy wheels with all-season tires, R-Line front grille, bumpers, trim, and rear spoiler. Inside included a combination of leather and carbon fiber trimming, heated 6-way power seats with lumbar support, rear camera system with blind spot monitoring and rear traffic alert. MSRP for the 2018 Passat starts at $22,995 and goes up to $24,995? for the 2.0T R-Line. Fuel averages 25 mpg city/36 highway. Volkswagen also doubled the length of the bumper-to-bumper warranty for 2018, to six years or 72,000 miles on all models. The newly introduced 2018 VW Atlas is a large size SUV that can transport families, pets, and cargo. I tested the top-of-the-line 2018 Atlas SEL Premium 4Motion, powered by a 3.6-liter DOHC V6 direct fuel injection engine. MSRP for an Atlas starts at $30,750 and ranges up to $48,490 for a fully loaded SEL model. Fuel economy averages 22 city and 26 highway. It has third-row seating for seven passengers and a panoramic sunroof that runs the length of the roof. I tested the top level Tiguan SEL Premium 4Motion with a 2.0-liter 8-speed automatic transmission, which starts at $37,550 MSRP. The base Tiguan S model starts at $24,595 with a panoramic sunroof and 3rd-row seating. The Tiguan Limited starts at $22,250 with two rows and five seats. 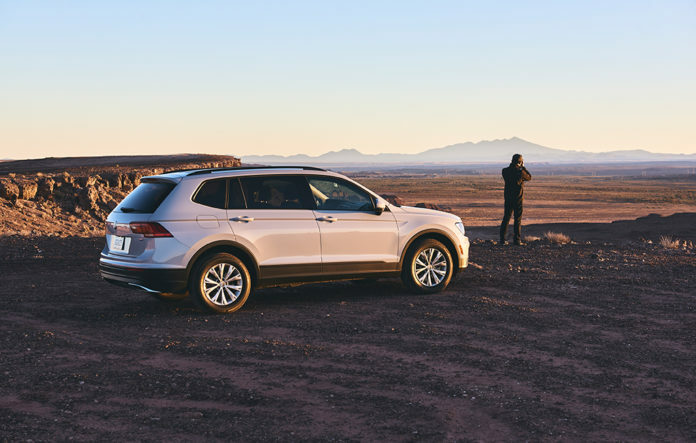 The 2018 Tiguan can carry from five to seven passengers with the optional 3rd-row seat. It?s redesigned for more cargo capacity and is 10-inches longer than the 2017 model.